A goal poked in by Fred only in the second minute probably set the tone for this uncharacteristic rout of the World Champions; but the simple truth of the matter is that Spain never really showed up to make a game of the final. Further goals by Neymar just before halftime and Fred’s second just two minutes into the second half underscored Brazil’s superiority on the night when Sergio Ramos even contrived to miss a penalty in the 54th minute. When Gerard Piqué was shown a straight red for a foul on Neymar in the 68th minute, it was game, set and match for the hosts with still a quarter of the match to go. Yet, it can be argued, Spain really lost the Confederations Cup – which it has never won – in its effervescent 2-1 opening match victory over Uruguay, the South American champions. So brilliant were Spain on the day that one feared such a performance would be difficult to replicate later on. On the other hand, Brazil had won the two previous stagings of the Confederations Cup, a tournament that the Spaniards still have to lay their hands on. The mental pressure to win it may actually have been greater than winning the World Cup itself. Worryingly for Vicente del Bosque, whose worst loss as national manager this was against Brazil, his team was never allowed to tiki-taka its way through the match. Brazil defended as a unit, often naughtily. On the other hand, football is not a game for the faint of heart; and the Spaniards could have used some of its famous matadors’ bravery. Still, this was a curious match particularly for older fans used to Brazilians knocking the ball about on the floor. Today all the passing along the carpet was being done by the men in red. The long balls that Brazil used to unlock Spain were almost traditional English, if with typical Brazilian skill and flair in the opponents’ defensive area. The dummy that Neymar sold Aspilicueta to set up Fred’s second of the night, for instance, was classic Brazilian art in motion. Further food for thought for Del Bosque will be that all three of Brazil’s goals were conceded from his team right flank. It was not so much that Neymar played there. Rather, it was the way the rightback gravitated inside when the attack was in the opposite flank, conceding to Brazil the freedom of the park behind. In conceding all three goals, Spain’s backline was also unprotected by its midfield. This was in stark contrast to the way the hosts played. The Brazilian midfielders chased and harried, blocking the passing lanes and never allowing Spain to slip into its passing rhythm. There is the little matter, of course, of Brazil having a day’s rest more than the Spaniards since the semi-finals, always a contentious matter in a short tournament like the Confederations Cup when there is little recovery time accorded the participants. Why the two semi-finals matches could not have been scheduled on the same day is probably a marketing ploy. That does not make it fair, needless to say. A word of caution to the Brazilians, however. They might just have shown the rest of the world how to beat the Spaniards. Brazil being hosts of the next World Cup is not something to lightly cast aside; but they are not the only pretenders to Spain’s throne. To the neutral, perhaps the strangest thing about the way Spain played was the world champions’ abject lack of composure. Even the tried and tested Barcelona Batman and Robin act of Andres Iniesta and Xavi were missing what would otherwise have been routine passes. 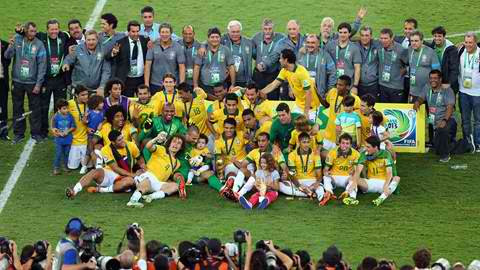 And for Brazil, a worrying statistic may be that no Confederations Cup winners have gone on to win the next World Cup. We will all have to wait another year to find out if there is any point to this statistic. Confederations Cup logo from Wikipedia. Brazil team photo from FIFA.com.